At the end of Washington’s first year at Hampton, he was again confronted with a lack of funds with which to travel home. He was so poor that he did not even have enough money to go out of town to get a job. Homesick and desperate, he attempted to sell his coat for cash, but the buyer wanted to pay on a payment plan with installments, only putting down five cents. After all of the students and staff traveled to visit their families or secure summer jobs, Washington was left in Hampton to try to support himself through the summer. One of Washington’s most frequently recurring struggles is finding enough money. However, he believes that one can overcome any financial burden with the application of hard labor. Therefore whenever he discusses problems with money, he usually will follow with a description of how he worked to overcome these problems. At the end of the school year, Washington still owed Hampton $16, and he resolved to pay it off by the end of the summer. He took a job as a waiter and began to cut back on all of his expenses in order to save as much as possible, but by the end of the summer, he still did not have the money. In the last week of his employment before he resumed school, he found a ten-dollar bill under a plate. Those ten dollars would solve almost all of his problems, but Washington felt that he should tell his manager, since it was his manager’s restaurant. Much to Washington’s dismay, his manager took the money as his own and did not reward Washington with anything. Once again, Washington was penniless, and he had to go back and face his debt without any money to offer. Washington again highlights monetary obstacles that he has to overcome in order to succeed. This passage is the “struggle” section of Washington’s problem-struggle-solution paradigm. Despite his setbacks, Washington was not deterred. He was tired of people telling him how he could not succeed, and he was determined to find a way to re-enroll in the Institute on his own merit. His determination led him to meet with General J. F. B. Marshall, Hampton’s treasurer, who granted him reentry into the Institute and trusted Washington to pay off the debt when he could. Despite Washington’s insistence that his accomplishments are only the result of hard work and perseverance, often Washington receives aid from those above him. Washington is always grateful and credits those who help him, but he is also insistent that it is only his labor and merit that allows him to accomplish his goals. After his narrative of overcoming the obstacle of his debt, Washington begins to account for the most important lessons that he learned in his education during his second year at Hampton. Firstly, Washington claims that he learned much more from watching his teachers’ selfless labor for their students than reading his books. Secondly, Washington claims to have learned quite a lot from working with the Institute’s livestock and fowl (birds). Thirdly, in his lessons with Ms. Nathalie Lord, Washington learned the importance of the Bible, both in its lessons and in its literature. These lessons are foundational in the formation of Washington’s educational philosophy. He sees the selfless labor of his teachers and wants to emulate it. He learns the value of the industry of keeping stock and fowl (domesticated animals) as well as the importance of spiritual upkeep. These lessons will directly impact his formation of the Tuskegee curriculum later in the narrative. Washington also attributes Ms. Lord with developing his ability as a public speaker. After finding out that Washington was gifted in oration, Lord began to give him private lessons in articulation, posture, and manner. These lessons, in conjunction with his time attending debate society meetings, helped to develop the public speaking skills that would grant him fame later in his life. Although Ms. Lord does not play a major role in the narrative after this passage, her contribution to his development as a public speaker is deeply significant to Washington’s later life. His public speaking ability is arguably one of the most significant qualities that he develops at Hampton. At the end of his second year at Hampton, Washington was able to go home as a result of money sent by his mother and brother John as well as a gift from one of his teachers. Washington was met with great celebration back in Malden, and he was asked to visit and eat with each family in the town as well as speak at the church and the school. Washington includes this passage to highlight just how much the black citizens of his hometown value education. Washington returned, however, in the midst of a labor strike by the miners demanding higher wages and better treatment. Washington feels that the laborers’ efforts were wasted on the strike, however, for the mining companies were able to hire temporary employees while the miners were striking, and most of the miners ran out of money rather quickly and were forced to return to the mines for no better wages. Washington sees this as a great waste of savings and as a foolish endeavor. Washington repeatedly denounces political action throughout his narrative. He believes that this sort of activism only creates false and constructed forms of uplift for African Americans, and often these forms of progress crumble under pressure. Washington sees such actions as foolish and wasteful. He would much rather the miners prove their worth through excellent labor and hard work. However, Washington is drawing from one particular example, that of this worker’s strike, and drawing very general conclusions from it. There is little historical evidence to back up this claim, and most sweeping reforms of labor rights were achieved through protest or political agitation. During the first month of being back, Washington decided to go out to look for work. He traveled a considerable distance, and on his way back, he stopped in an abandoned house to rest. During the night, John found Washington and informed him that their mother had died during the night. Washington was heartbroken and felt lost. A large reason for his educational striving was to be able to provide for his mother’s comfort. He was grieved that he would never be able to do so. Washington’s mother served as an anchor for him, connecting him to his hometown and his family. After her death, Washington focuses all of his energies on his career as an educator and rarely mentions his home life or his hometown. Washington’s mother’s death left the family’s home in confusion. Amanda, Washington’s sister, was very young and did not know much about how to take care of a house, and Washington expected her to at least partially fill the role of homemaker. Even though food was scarce and the house was often messy, Washington was able to find work with his old friend Mrs. Ruffner and in a coal mine in order to support his struggling family. With his home in disrepair, it seemed unlikely that he would be able to return to Hampton. Washington claims to have solved his family’s crisis after his mother’s death by labor and hard work. Although he does not explicitly say so, Washington most likely detested the uncleanliness of the house and its disarray, as he felt that a virtuous house was a clean house. It is significant that it is labor, not help from the community or familial bonding, that solves the problem. Also note that Amanda, as a woman, is assumed to act as the homemaker despite her youth and inexperience. But through his persistence and hard work, Washington was able to secure enough money to return to Hampton. Three weeks before he was to return, Miss Mary F. Mackie, the teacher who conducted Washington’s “sweeping” examination, wrote to him asking him to return two weeks early to assist her in preparing the school for the returning students. Washington saw this as an excellent opportunity to pay off his debt to the treasury, so he gladly agreed. If Washington’s mother’s death is the problem and his hard labor in Malden the struggle, then Ms. Mackie’s proposal is the solution in this iteration of the problem-struggle-solution paradigm. Washington was eager to labor with Miss Mackie and prove his worth both financially and academically. Washington was shocked by Miss Mackie’s work ethic and her willingness to work alongside him for long hours, despite her roots in upper class society. For Washington, Miss Mackie is the ultimate example of the importance of finding dignity in labor. Throughout his narrative, Washington suggests that those in upper class society have gotten to their positions through their exemplary merit. So whenever he introduces a rich or famous person, he is always sure to explicitly mention that person’s merit. Washington’s last year at Hampton was marked by two major “benefits.” The first benefit was contact with General Armstrong, whose character Washington deeply wishes to emulate. The second benefit was finding out the “true” value of education: not that one should have a free and easy time, but that one should find dignity, strength, and self-reliance in labor. Again, Washington highlights the merit of Armstrong by constructing him as a figure who is so virtuous that he is above reproach. This idea of the rich as inherently virtuous and deserving of their fortune fits into Washington’s worldview and ideology, but is clearly very problematic. Many of the rich families that Washington names in the narrative, such as Rockefeller and Carnegie, acquired their wealth through a combination of inheritance, family connections, and questionable business and labor practices. So while Washington may believe that their wealth is indicative of their virtue, it is more indicative of their connections and lack of scruples. When Washington graduated, he was once again out of money, so he took a job as a waiter in a hotel restaurant in Connecticut for the summer. However, Washington did not know how to wait tables properly at such an establishment, and after being scolded severely for poor service, he was demoted to dish washer. Washington was determined to learn how to succeed as a table waiter, though, so he worked at fixing his flaws and eventually was restored to his position. Since that time, he has been a guest multiple times at the same hotel. Here there is another “problem-struggle-solution”: Washington’s problem was that he was unqualified to wait tables for a high-class hotel restaurant, and his struggle occurred when he was fired. However, his solution, like most of his solutions, comes through the application of hard work and improvement. After the summer in Connecticut, Washington returned to Malden and was elected to teach at the black school. 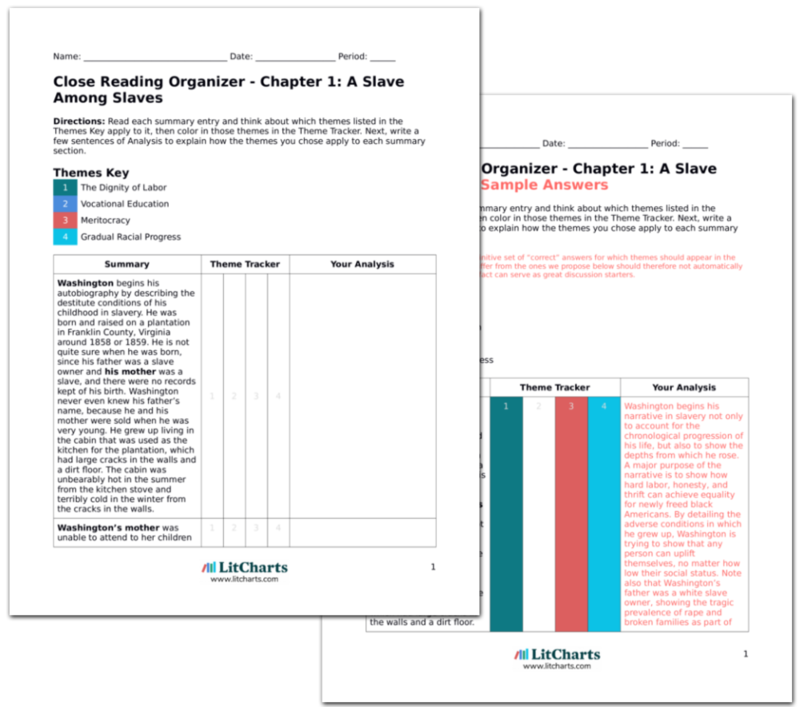 Washington believed that the curriculum should not just include book learning, so he worked from 8 am to 10 pm every day in order to give students lessons in hygiene and general cleanliness. Washington believes that the toothbrush, above all tools, is one of the most important to civilization. Teaching in Malden provided Washington with his first opportunity to apply his educational philosophy. He worked long days to ensure that his students learned the importance of self-improvement and book learning. His claim that the toothbrush is the one of the most important tools demonstrates his feeling that appearance and cleanliness are both important factors in demonstrating merit. There was so much interest in Washington’s instruction that soon he had to open up a night school for both the young and old who were required to work during the day, as well as developing a reading room, running a debating society, teaching Sunday School, and giving private lessons. All of his classes were constantly filled with poor students eager for an education. For all of this work, Washington received little to no salary, but he was satisfied simply serving his community. This night school is a precursor to the one that Washington will help to run at Hampton and the eventual night school that he will found at Tuskegee. Washington sees the grueling schedule of the night school as a test that can serve to prove the worth of poor students who cannot depend on their money for an education. Washington was also able to provide for his brother John’s education during this time, with private lessons and monetary support. John was able to attend the Hampton Institute and eventually secure a position as Superintendent of Industries at Tuskegee. Since John previously neglected his own education and material security to ensure that Washington had access to an education, Washington was more than willing to reciprocate with his aid upon his return to Malden. He was also able to secure his adopted brother James an education at Hampton and a position as postmaster at Tuskegee. While Washington largely focused on his career after his mother’s death, he still attempted to take care of his brothers by providing them with an education. To Washington, the best way to take care of his brothers was to educate them, as this education provided them with a means by which to raise their positions in society. During his time in Malden, the Ku Klux Klan was at the height of its activity. Washington compares the Klan to the “patrollers” of slavery times: poor whites who would patrol the woods at night looking to harass slaves running errands for their masters or catch runaway slaves. As a witness of the violence and suppression aimed toward black Americans from the Klan, Washington calls this time “the darkest part of the Reconstruction days.” Washington then pivots, however, and suggests that the days of the Klan are over, and that the South has evolved so much in its racial views that it would not ever permit organizations like the Klan to operate again. Washington even pushes this idea further, claiming that the Klan has been practically forgotten by both black and white Americans. The Ku Klux Klan is an infamous racial group that protested the equality of black Americans through violence and intimidation. Washington is correct that after Reconstruction many chapters of the Klan disbanded because, for the most part, they were successful in disenfranchising black Americans from the right to vote, own property, or even exist in peace. However, Klan activity resumed in the early 20th century after the publication of this book, and the early 1900s saw some of the worst violence from the Klan, which lasted until well after the Civil Rights Movement of the 1960s. The Klan also still exists today, although it is nowhere near as popular or actively violent as it used to be. However, the Klan’s continued activity demonstrates that Washington’s vision of a racially harmonious future has not been realized to the extent that he claims. Bunzey, Tyler. 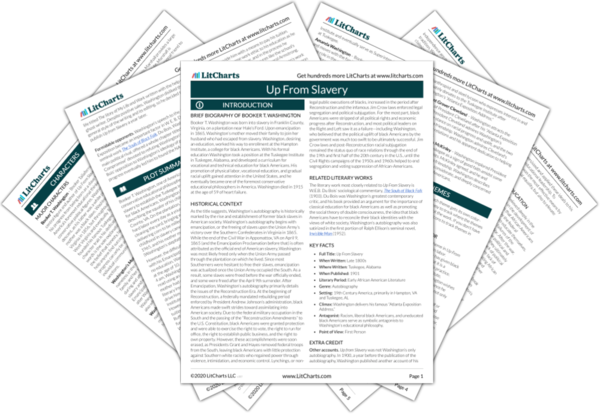 "Up From Slavery Chapter 4: Helping Others." LitCharts. LitCharts LLC, 7 Sep 2017. Web. 20 Apr 2019. Bunzey, Tyler. "Up From Slavery Chapter 4: Helping Others." LitCharts LLC, September 7, 2017. 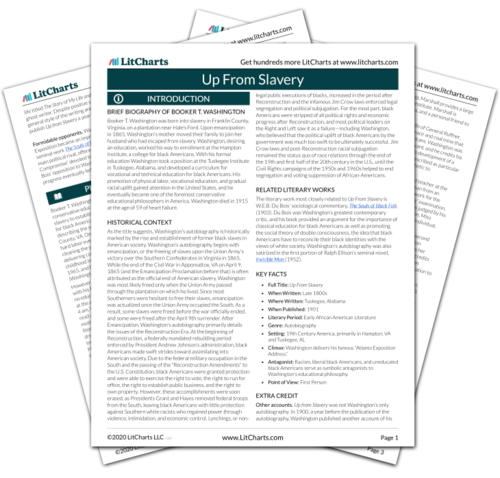 Retrieved April 20, 2019. https://www.litcharts.com/lit/up-from-slavery/chapter-4-helping-others.